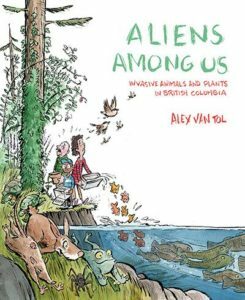 This informative book introduces readers to a multitude of creatures that have taken up residence in British Columbia. It is laid out in a user-friendly way and a section at the back of the book has great ideas about how people can help. Van Tol uses photographs and illustrations to inform the reader about some of the risks associated with the introduction or spread of non-native species. Some of the facts about the plants and animals and how they were introduced to British Columbia are very interesting. For example, students may be surprised to learn that the Pacific Chorus Frog (Pacific Treefrog) was introduced to Graham Island in Haida Gwaii by a young boy who brought tadpoles in a jar to his new home because he liked hearing their sound. The book describes a range of “aliens” including garden plants, insects, fish and mammals. A risk rating is attached to each species to help understand how destructive it can be to the environment or to the native species it competes with or displaces. Classroom Connections: Students may enjoy reading through and pronouncing the list of scientific names of species. The information on each species is informative and brief, allowing students the opportunity to gather information quickly, and is written at an appropriate reading level for easy comprehension. A classroom project could involve students reading about one “alien” and sharing their information with others. A quick fact sheet could be completed and a mapping activity could be used to show where species are found in B.C. As schools start to embrace more outdoor classroom experiences, this book would be an excellent resource for having students identify and prevent the further spread of invasive species.